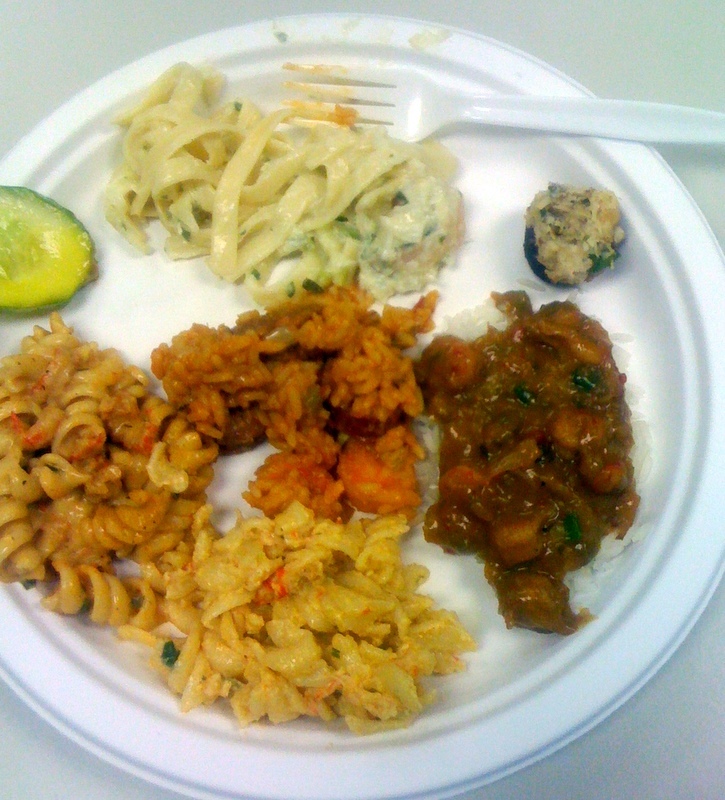 My Louisiana Studies 303 course (Food & Culture in Louisiana) at Tulane finished this week….pictured is a sampling of savory foods cooked for the final exam. Students prepared two versions of Crawfish Monica, crawfish etouffee, creole jambalaya, mixed seafood fettucini, crab-stuffed mushrooms, homemade pickles (from homegrown cucumbers), and Zapp’s potato chips. Last night’s sweet dishes included made-from-scratch king cake, beignets, and strawberry shortcake. We also feasted earlier this week on fried chicken wings from Manchu, venison stew, stewed alligator, grits & grillades, creole tomatoes, crab & bacon devilled eggs, seafood bisque, homemade French bread, sweet potato pies, and pecan bourbon tarts. Throw in a few Sazeracs and some drive-thru daiquiris, and it was a tasty finale to summer school. And what is your favorite recipe for Crawfish Monica? I’ve seen quite a few knockoff recipes but haven’t tried any. Not that I can actually get crawfish here, but I’m curious. Maybe some will turn up in the yard next time we are flooded by the irrigation. I don’t have a favorite recipe for CM, as it’s not my favorite dish. One student purchased the “official” version sold in area stores, and another student’s version was quite straightforward: garlic & green onions, half & half, Creole seasoning, and crawfish sauteed together, tossed with cooked pasta. It was tasty….I think the original version has a hit of oregano in it. I wish I had taken your class at Tulane!